Whether it’s dull, worn or even damaged wood flooring, the family owned and operated father and son team of C.C.H.F. has seen it and done it all when it comes to wood and hardwood floor installation, resurfacing, repairing and refinishing. Attention to detail and proper preparation is key to a high quality floor finish and installation. In fact, the vast majority of our work comes from word-of-mouth referrals for the last two decades. We carry $1M in liability insurance and provide plenty of references upon requests. If you’re doing your research about wood flooring, just remember that a beautiful, long-lasting wood floor can be installed as either finished or unfinished wood. With so many varieties of woods to choose from, a finished hardwood floor is the most common choice because it will give you the most durable floor and requires the least amount of maintenance. Unfinished wood can be beautiful too as it ages but will be more prone to spot staining after a while. More importantly though is the craftsmen who install your floor. A long-lasting gorgeous finish only comes from an experienced professional who will first evaluate your traffic conditions, sub floor condition, heating, cooling and humidity factors and overall spacing requirements before installation. Without these considerations, disaster is only pending. Health Effects – Hardwood floors are recommended by doctors for patients with allergies that carpet typically holds in it. 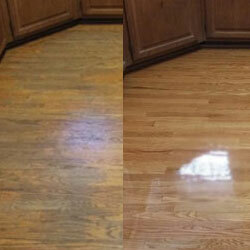 Refinishing – Every wood floor is different. Know approximately how long before you may need to refinish it, or if it can even be refinished! Durability – What is the traffic like in your home? 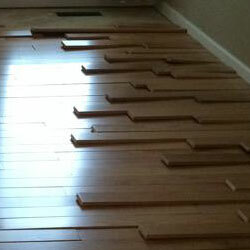 Hardwood floors can take a beating well. 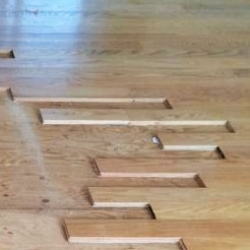 FYI… professional basketball courts have maple floors! 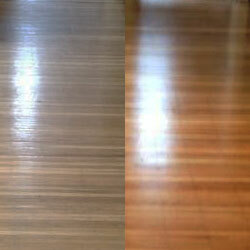 Maintenance – Maintaining finished wood floors is simple and very inexpensive. No need for harsh chemicals either! Compare the cost to other flooring types. Is an inexpensive floor really cost effective if it only lasts several years? A good hardwood floor will last a lifetime. Environmental consideration – Did you know that American hardwoods are sustainable, renewable and environmentally friendly? Every year, our hardwood forests grow twice as much wood as we harvest from them! Have pictures or documents to share?